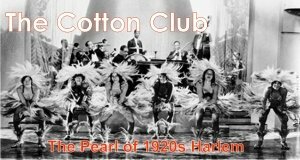 During the Harlem Renaissance The Cotton Club was one of the most famous nightclubs in history. The Cotton Club's story points at many reasons why we love the 1920's and also why the decade has a split personality. Jazz is art of individuals working in unison to create a sublime sound. Like the rest of the 1920s, jazz distinguishes itself by being different from the mainstream. Jazz lent itself perfectly to small nightclubs and speakeasies that dotted Harlem. Gangster Owen "The Killer" Madden bought the "Club Deluxe" from Jack Johnson, the former boxing world champion, and renamed the venue The Cotton Club. Madden was a sharp businessman who had spent 9 years in Sing Sing prison for the murder of Little Patsy Doyle. As his nickname suggests, Madden was tough, despite his frail appearance! He was tough as a man and as a boss. In his younger years, Madden was shot eleven times at close range by three members of a rival gang, the "Hudson Dusters." Within a year, Madden had recovered from his wounds and many the rival gang members were dead. Madden was not a man to mess with. Madden ruled the Cotton Club, he had no tolerance for screwups and maintained a white-only customer policy. Even in the heart of Harlem, the race line divided the black performers from the white patrons. Inside the Cotton Club African themes were exploited and only "jungle music" was played to an all white audience. The early years of The Cotton Club can be seen through the eyes of the great bandleader Duke Ellington. The pressure Madden put on Ellington was severe, but the thing about greatness is it flourishes under pressure. Duke put together one of the most talented jazz bands ever to walk on stage to play for the patrons of The Cotton Club six nights a week. Led by Ellington, the band's distinct "mellow" sound came from alto saxophonist Johnny Hodges. While Hodges was not the most talented player, his sound was "so rich that even a single note could resonate with a universe of emotion." As the twenties roared on, Ellington would parlay his huge success at The Cotton Club into many classic recordings, cementing Ellington to go down in history as one of the great jazz musicians and entertainers ever. 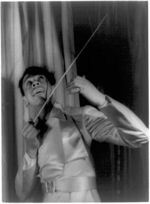 Ellington left his roost at the later years of the Harlem Renaissance Cotton Club bandleader in 1931, leaving the throne to the colorful Cab Calloway. Who some say got the job through mafia urging. While Calloway was not the musician of Ellington's caliber, he did have a distinct style. His scatting style lent itself to crowd interaction, he'd yell out "Hi-di-hi-hi-di-EYE!" The crowd would chant back: "Oh-Di-Oh-Di-Ohhh!" Calloway had a flair for the fun and dramatic! These two talented bandleaders set the stage for many more talented artists to grace the club's stage. During the waning years of the Harlem Renaissance Cotton Club, Ella Fitzgerald ascended the stage at the tender age of 17, after she'd been discovered at a talent show in Harlem's Apollo Theater. Despite the racial barriers that it promoted, the Harlem Renaissance Cotton Club is one of the great nightclubs in history.